I wasn’t aware netbooks with dual operating systems have hit the stores in India. This week I went to a store, Tata Chroma, with an intention to buy a netbook, Samsung make, to gift it to a family member. While the 15k samsung netbook was readily available, store guy also showed me an equally priced acer netbook, which had an additional operating system, Android from Google. The android platform is steadily gaining popularity in mobile phones market and in US, Andoid smartphone is increasing its marketshare month on month, at the expense of Apple’s iPhone, RIM’s blackberry and Microsoft Windows 7. I wasn’t sure how good/relevant Android OS was as far as netbooks are concerned. I had to make a choice between Samsung and Acer netbooks. I made a twitter update,asking my friends to share their opinion, 80% recommended Acer and rest Samsung. Powered by online recommendation and with an intention to checkout Andoid OS, I bought the Acer ApireOne D255 netbook. This post is a quick review of the netbook, as well as Android as an OS for netbooks. Netbook, as you’re aware, is a stripped down version of laptops. Priced affordably in 15-20k range, powered by Intel Atom processor, small and light weight, 8 hour battery life, netbooks are ideal for those looking for basic computer functionalities and internet related work. There’s no CD drive, screen size and keypad layout is smaller and processor, storage and memory capacity are limited, but these are practical enough to get some work done. Comparatively, Samsung netbook had N455 atom processor, while acer D244 has N450. Rest of the configuration remains the same. Battery lasts cool 8 hours at optimal usage, 60days MS office trial and some stupid useless trial games are included. 10.1 inch LED screen, 138GB HDD (manufacturers continue to claim inflated HDD space), multi-gesture are few other features. Windows XP OEM doesn’t have a provision to have user defined system restore point. 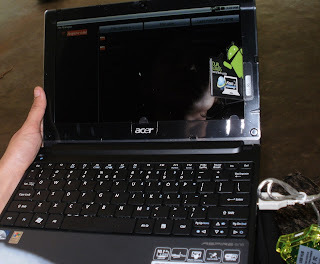 Since netbooks do not have a CD drive, acer should have given recovery kit along with the unit or should’ve given an option to create one on a pendrive. But recovery discs need to be created manually, using an external CD drive. This was my first encounter with Android. Android loads real fast compared to Windows. But then, its default menu looked very minimal-much like that of a mobile phone. Menu had alarm clock, browser, calendar, camera, contacts, email, file manager, gallery, messaging, music, network manager, power management, settings, talk and webmail. There’re a few major flaws: Acer has done 2 partitions to the hard disc of the D255 netbook. The windows partition is given about 134Gb space (13+GB used and 120GB free), only about 4GB is provided for android partition (1.35Gb used and 2.63Gb free) (this can be readjusted using specific tools by those who’re experienced in windows OS, but for novice people who wish to use Android as primary OS, 2.6GB will soon be too short) Another major disadvantage, is that when in Android OS, one can’t access the windows partition, hence any files and folders saved in C drive is not accessible in android. (is there a workaround for this?) This way, you can neither access your media and work files stored in Windows XP, nor can you use Android OS as a backup OS in case windows crashes. It doesn’t make sense to have two copies of your files one for each OS. It works the other-way round though- Android files can be accessed from windows. Acer has included a separate manual for Android OS in the box, which can be handy for first time users. There is no MS office equivalent in Android, any decent games or other useful apps that we’re used to in a Windows OS. If the netbook is primarily for offline use, Android is not yet a replacement for Windows. However, if you’re connected to internet all the time, Android draws strength from Google and one won’t miss windows much. You can sync with your Google account, import all contacts, use Google documents, and download from an ever growing library of android apps and so on. Android platform is 3G ready and can go well with 3G connectivity now unveiled by all operators. Overall Acer AspireOne D255 looks like a decent buy in netbook category, though Android OS will continue as a fancy feature for the time being. Acer comes with 1 yr warranty. Additional warranty is optional at about Rs 1200 per year. Samsung netbook is the closest rival. All other netbooks from HP, Dell and Lenovo cost 2 to 3k more, with almost same configuration. As you have said, it sounds too complicated to a novice like me! But good to hear that in future Android may become more mainstream. Good review of the product. Just wanted to point out something you have mentioned about Andriod market. It has snatched up some of the RIM market for sure, but not much from Apple. The Q3 results of Apple shows a whooping 45% increase in sales and in numbers it has also overtaken RIM and entered the top 5 in sales pushing out Sony Ericsson. And Andriod certainly does not take out anything from WP7 as we are yet to get the first WP7 phones in the retails. They are just announced and not released yet. Thanks for updating buddy... A precised review. Looks good... First time I am hearing it too, nice review!! Hmmm...sounds interesting. Didn't know that the android platform could be exported onto the netbook. Why would anyone need two operating systems on a netbook? Somehow defeats the purpose of having a lean mean functional device. Anyways, great review. But, I will still wait n watch this new era of devices that promise to be lean but carry loads of crap in them (that we have to pay for). Why didn't you think of the ipad or the galaxy? Any specific reasons not to? Wanted a basic laptop like device to aid a family member in academic activities. hence netbook was well priced and reasonably ideal. iPad is out of question and mobile phones are not ideal.